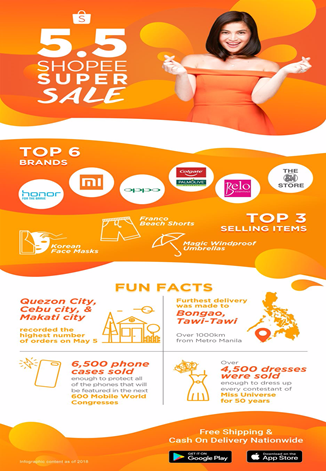 5.5 Shopee Super Sale, the biggest mid-year online sale in the Philippines, wrapped up with a bang last week with a mega 24 hour online shopping bonanza on 5 May. Millions of users from across the country shopped non-stop promotions, flash deals and discounts up to 95% off. Top favoured items among Filipinos were Korean Face Masks, Franco Beach Shorts and Magic Windproof Umbrellas - looks like everyone is gearing up for summer in the Philippines! Limited edition surprise boxes, specially curated by Shopee brand ambassador, Anne Curtis, were one of the hottest items during the sale. Exclusively available on Shopee, the surprise boxes were wiped out in a matter of minutes. Anne’s Mon Amour box, featuring a curated selection of popular men products proved to be the biggest hit, with all boxes sold out within just nine seconds. While 5.5 Shopee Super Sale may be over, look out for even bigger campaigns in the months ahead!